The idea was that \expandafter would cause the text following the invocation of \myfirst (either an invocation of \mysecond or some arbitrary other code) to be expanded while \consecutivetrue is in effect, so if the next thing is a \mysecond invocation, the \ifconsecutive will be executed and the arrow generated, while if something else follows, it will not care about \consecutivetrue. After that expansion, \consecutivefalse should be called, causing any later invocation of \mysecond to not generate the arrow. However what actually happens is that the arrow never gets inserted, no matter whether the macros are consecutive or not. Now my question is: Why does this pair of macros not work as intended? You don't want to just expand \mysecond, but also the \ifconsecutive that results, so you need three \expandafter tokens in front of \consecutivefalse. However, I wouldn't recommend such context sensitive macros. Not the answer you're looking for? Browse other questions tagged macros conditionals expansion or ask your own question. Why does this protection not work? How to detect that some macro expands to empty string or spaces only? 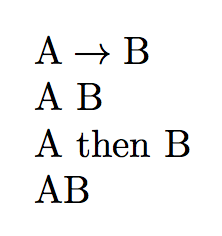 How to force-expand a \def for \in@? How can I define a macro with the value of a fully expanded macro?